Anyone who works in an office environment or uses a desktop computer at home knows how annoying and distracting it is to be sitting in an uncomfortable position, but the way you sit at your desk can also have long term implications on your health. Sitting in an unsuitable position for 7-8 hours a day 5 days a week over a number of years will affect you in a number of ways, but just a few simple adjustments can help prevent this. One of the most important steps to take is to ensure you have sufficient support for your back and the easiest way to do this is to have a properly adjusted chair. Most offices now have chairs that are adjustable so if this is done correctly back strain should be reduced. It is best to keep feet flat on the floor with knees level with your hips and your wrists and forearms level with the floor when using the keyboard. Elbows should be at the side of your body forming an L shape at the joint. All of this will help avoid back strain and repetitive strain injuries (RSI). Feet should be placed flat on the floor where possible, but to keep knees level with hips it may be necessary to use a footrest. It is important to remember not to cross your legs as this can cut off your circulation and may even cause hip problems. 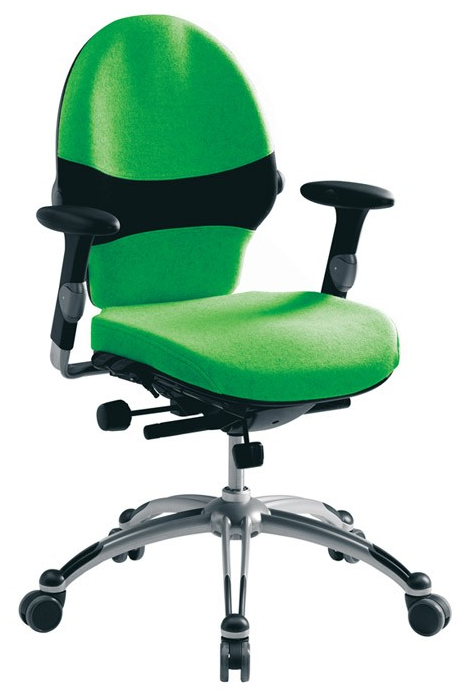 There are many sources of high quality office chairs, Fineback Furniture being a very reliable one. FineBack Furniture was established in 2006 as a retail showroom based just outside St. Albans In Hertfordshire. The company specialises in the sale of good quality, ergonomic seating and furniture designed for both the home and commercial environments. We believe in offering our customers good product advice and in many cases the opportunity to try in store before you buy. Choosing the right office chair, either an ergonomic office chair or an executive chair will no doubt make those hours spent at your desk more pleasurable. As well as sitting properly, it is important to ensure your work equipment is in the proper place. Monitors and screens should be placed around an arms length away with the top of the screen roughly at eye level - stands can be used to help adjust the height if necessary. This will mean you donâ€™t have to bend your neck if it was too high or low which can be uncomfortable. Keyboards should be kept roughly 4-6 inches away from the front of the desk with wrists kept straight and elbows vertical to your shoulders by your side when using it. Wrist rests can be used to help keep wrists straight and level with the keyboard. If using a mouse, it is advisable to keep it as close to you as possible and it may even be a good idea to use a mouse mat with a wrist rest to prevent awkward bending which can become painful. As well as keeping your mouse and keyboard close to you, it is also a good idea to keep any objects you frequently use close to you to avoid constant stretching or twisting to reach them, such as your phone or stationary. If you do use your phone a lot it may also be a good idea to use a headset as holding the phone between the ear and shoulder all the time can strain the muscles. Any discomfort felt while sitting at your desk may be a sign that you are doing it wrong, but when these signs disappear at evenings and weekends it is easy to ignore them. However, sitting in a bad position over a number of years will eventually alter your posture and may lead to constant pain. Warning signs of repetitive strain injury (RSI) include tightness or numbness in the hands, wrists, elbows or shoulders. If any of these occur or persist then speak to your doctor as the longer they are left untreated the harder they are to treat. However, if you follow the steps above as well as taking regular breaks away from your desk then you will not only begin sitting more comfortably but may also become more productive in the workplace.